City politicians in Oslo launched their latest strike against motorists this week, part of their battle on three fronts to discourage driving. Commuters into the Norwegian capital got an expensive taste of what it now costs them to drive into Oslo during the morning and evening rush hours, with much higher tolls aimed at prodding them over to public transport. Some commuters actually opted to get up early so they’d pass the Oslo toll station before the morning rush officially sets in at 6:30am. They saved NOK 10 (USD 1.25) by doing so: The toll that formerly was NOK 35 for all types of cars at all hours of the day, jumped to NOK 44 and to NOK 54 between 6:30 and 9am and from 3-5pm. It’s even higher for those with cars using diesel fuel: They now have to pay NOK 49 or NOK 59 (USD 7.40) during the commuter rush. In addition comes any extra tolls charged by neighbouring municipalities, like Bærum. 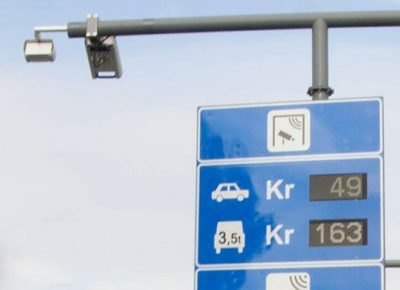 The tolls now charged outside the rush hours ( NOK 44 for hybrid cars or those using unleaded fuel and NOK 49 for diesel cars) are the same that will also be charged on holidays, weekends and during the summer holiday month of July. The vehicle’s registration (license plate) number defines what type of fuel it uses, based on information from state traffic authorities, and that’s what’s also automatically logged and charged when it passes through a toll plaza. The 70 percent increase in tolls for driving into Oslo is part of the city politicians’ plan (spearheaded by the Labour and Greens parties) to make driving so expensive and even difficult that motorists will give up using their cars and take the train, tram, metro or bus instead. They’re following their counterparts in Bergen, who began introducing differentiated tolls in line with air pollution levels. Other alternatives include buying a so-called el-bil (electric, battery-driven car), which aren’t subject to road tolls, or bicyling. The Oslo politicians have already been consciously removing parking places on the streets of Oslo and raising the parking fees for those that remain. Parking is also now restricted even in residential neighbourhoods, where those living there must obtain an annual permit that costs NOK 3,000 per car (USD 375), for the privilege of perhaps finding a street parking spot near their homes. Parking rates in city garages have jumped while street parking has been replaced with bicycle lanes or so-called “urban furniture,” including such things as benches or planter boxes. While dropping initial plans to make downtown Oslo entirely vehicle-free, city politicians have also been closing entire streets to vehicular traffic, and turning them into pedestrian-only zones. Deliveries to homes, businesses or offices on such streets are allowed only during certain hours. The politicicans say they want to relieve traffic congestion and improve air quality, along with promoting additional climate-friendly initiatives. Tolls are already set to rise again, and be charged both in and out of the city, to help pay for long-awaited improvements to the major E18 highway and for public transport improvements. Capacity on local bus and tram lines is due to increase from next week. Figures from Fjellinjen, the company that runs the Oslo-area’s toll system, showed no overall reduction in the total number of cars passing through the city’s much more expensive toll plazas on Monday. There was, however, a 7.3 percent increase in the numbers of cars passing between 6am and 6:30am, before the additional rush hour fee takes effect.